What would be the most appropriate toy for your kids? You would probably settle for something educational or intellectual as you want to help your child develop knowledge and skills. You would want a toy that could prepare a child as they grow while being able to enjoy things while learning. Searching for such would end you down with a lot of choices and could get confused as there are tons of products and types of toys to choose from. 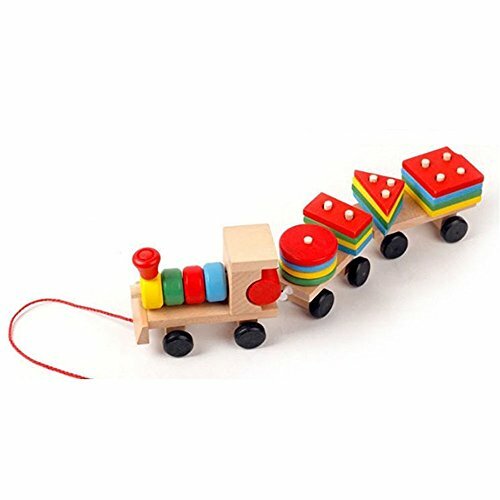 We recommend you to try out a wooden toy train as it has the versatility, fun, entertainment, educational and other more benefits combined from different set of toys. A wooden or plastic, block toys could also do a trick but only for a short amount of time as our child would get bored to it fast due to the limited functions and features it provides. A wooden toy train on the other hand is guaranteed to keep your child fun and busy as they learn things. Unlike a wooden block toys, train wooden sets have so many features. It ranges from being battery operated, motorized engine train car, sound features, train blocks, up to being able to expand. Yes, most wooden toy trains are compatible with each other, giving you an option to expand, not only the train tracks but also the train cars. Wooden train toys of different brands and manufacturers have set a standard to where most of their products are highly compatible with each other. Most of it also fits nicely on top of a wooden train table for an added decorative effect. This is a great benefit to parents and their child to have a versatile type of toy. It is also quite practical for most parents as they could easily add up or expand their set the moment their child starts to feel bored with their toy. It will bring about a whole new fun and will keep the joy alive. And in relation to being practical, these wooden toy trains are quite cheap and affordable. They are usually light on the pocket and due to the materials used (wood), it is most likely to last for a very long period of time. 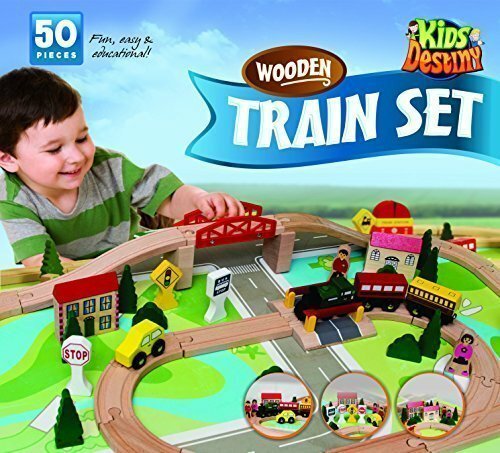 This wooden train toy set from Kids Destiny comes in 12 pieces of train engine cars. It is enclosed and neatly packed by a wooden frame. This set is a collection of wooden engine cars with magnetic couplings installed at each end of the train car. It allows great compatibility with other brand of wooden train cars as well as providing a more stable connection and fast and efficient assembly. This goes perfectly to all wooden tracks and could work great as an expansion set for your child’s existing collection of train cars. 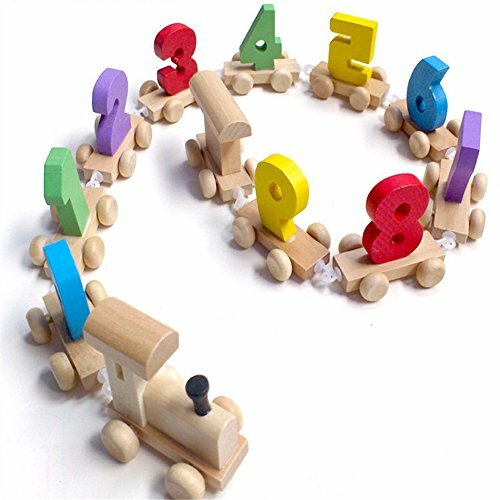 Talking about blocked toys that teaches kids about colors and numbers, here is a wooden toy train that does the same things but clearly provides more fun as kids can move it around like an actual train. This toy set is highly educational. The love for vehicles and trains is combined with numbers and colors to allow a fun way of learning. This will discreetly cultivate young minds to have a great interest in colors and numbers. It is also very strong as it is made from real wood but could be yours for a cheap and affordable cost. How about a medium sized toy and wooden train track set? 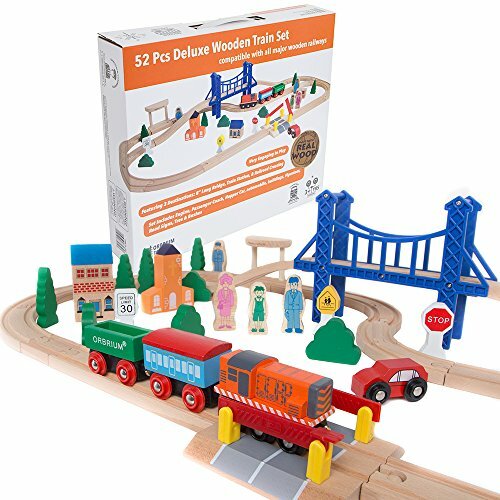 Orbrium Toys brings you a 52 pieces wooden train, deluxe set with 3 different destinations. This set is very engaging and widens the scope of your children’s creativity and imagination. The set uses premium wood for its tracks and cars. It is complete with buildings, automobile, passenger coach, road signs and all the necessary things your child needs to have a complete train layout design. This product conforms and is approved by safety and security standards from ASTM and CPSIA. 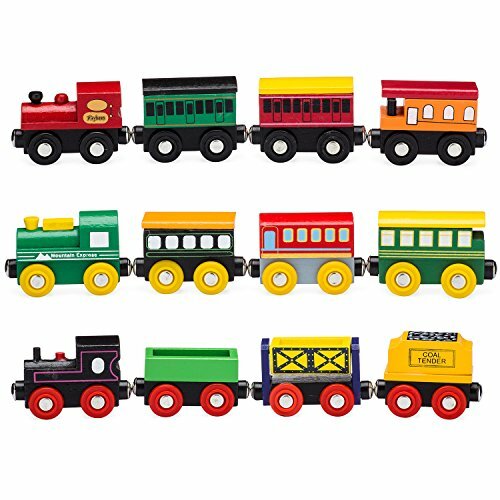 One of the best kids wooden train you can choose is a stacking train from Melissa & Doug. It is actually a block type toy train set that is designed to enhance the skill of a child. It greatly promotes color and shape identification, hand-eye coordination and creative play. The blocks are made from hard and durable wood, colored with non-toxic paint. There are 15 sets of colors in they can identify. Each block has holes to allow stacking. It is great for children of ages 2 and up. Below is an actual video footage of Melissa & Dougs stacking train. It is one of the best kids wooden train you can possibly look for to prepare your child’s mental and physical skills. This product can serve many generations of kids due to its remarkable durability. It won’t be a waste investment as soon as the child grows as it can be used by your 2nd or 3rd kids, grandchildren, young relatives and children of your friends or neighbors. 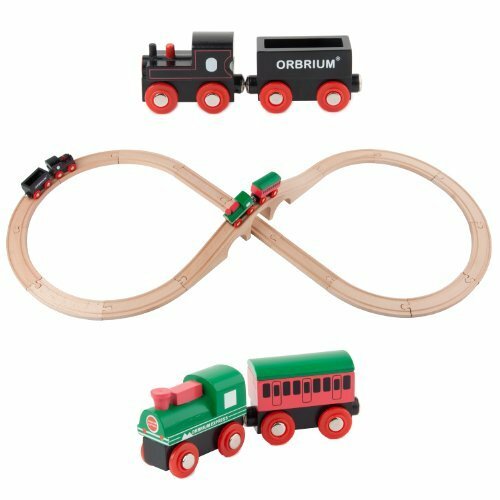 This is a wooden toy train set with triple loop track layout from Orbrium Toys. It highly fits with wooden Thomas and Friends, Chuggington and Brio train sets. It also has high compatibility over some other wooden train toy brands. The set is fully packed with all the things your kids need such as city vehicles, buildings, train coaches, train engine car and more. This product is guaranteed to have met a high quality standard as it is accredited and recognized by CPSIA. Orbrum Toys can always get better. This wooden toy train set is only one of there many creations that your children could greatly benefit from. Here is a short video that showcases the actual product. This will get your children’s train experience, one notch higher. You can choose to create your own track design or expand. Stepping back a little bit, you need not to take so much expense if you or your kids are beginners. You need to think about your wooden train playground plans so you can save some money in buying expensive set that is not suited for your kids. 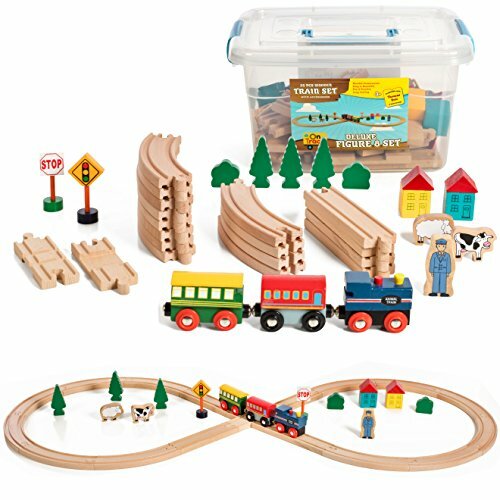 You could always invest in this affordable wood animal train set and later on expand into a larger set. It can be easily expanded due to its compatibility. You can check things and alter on add some tracks or some train cars. 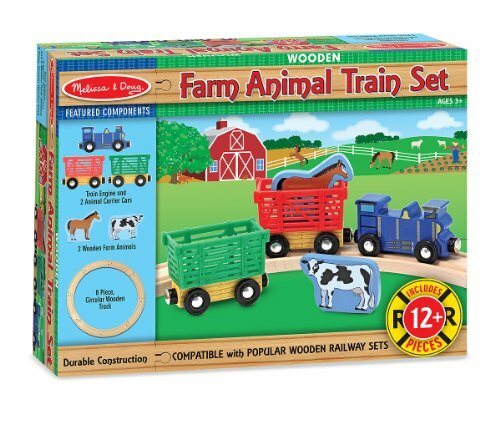 Another cheap and affordable wooden toy train as a practical investment is the Wooden Farm Train Set from Melissa & Doug. The set includes 3 linking train cars and a colorful train engine car. Each of these train cars are interchangeable. It can be placed at any point of the set. This train set however, finds it hard to connect with wooden train cars that uses magnetic couplings such as Brio, Chuggington, Thomas train set and other brands that uses the same coupling standards. Having a small train track layout would later get you decided in expanding as it will bore your kids easily. Expanding your train tracks however, will also require you to extend the length of your wooden train cars set and start your collection. 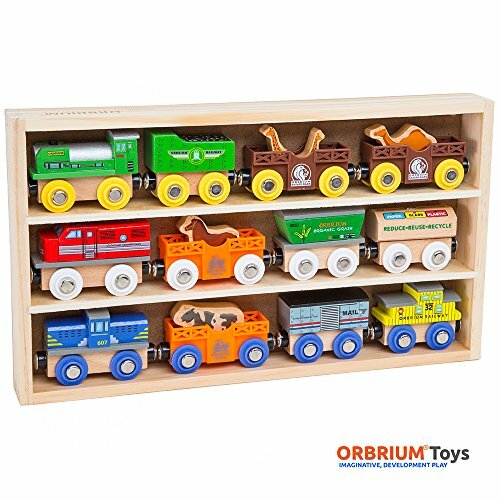 This 12 pieces of wooden train engine and train cars from Orbrium Toys gives you a chance to do so, and all for a great and excitingly low price. The set comes in a wooden frame and uses an animal or safari theme designs. This is one of the many high quality train toy products in the market that uses a wooden train bridge. The set features only one bridge at one end of the track layout but it comes with 100 pieces of train parts and accessories which includes 16 pieces train and cars. The default track layout in the instruction manual uses a triple loop design but can be adjusted to your design preference. 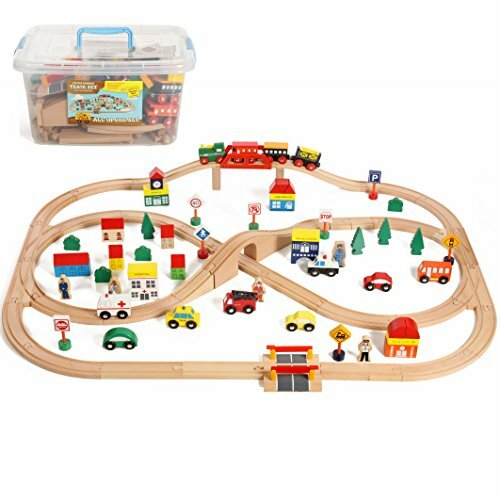 You can also have this set expanded as it can connect efficiently with all major brands of wooden toy tracks. There are so many wooden train track layouts you can possibly do when you expand your children’s track set but you also have the need to purchase more train cars as it can be very boring to have an expanded and large train track set with only a few train cars running. 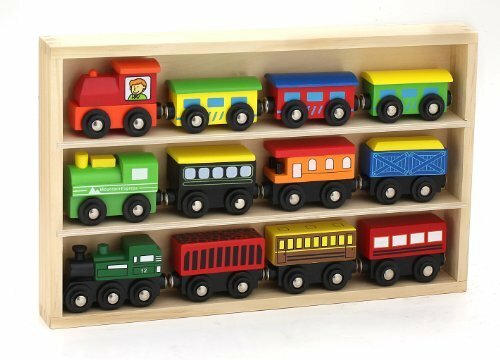 This is a 12 pieces train wooden cars from Playbees that uses magnetic couplings at each end on all of the train cars for a fast and efficient connectivity and allow it to fit with other wooden railway cars as well. Not all collection of kids wooden train cars are those ones that connects. This train car collection from the Right Track Toys can run on all wooden tracks but some of the pieces included can less likely connect with as it does not have magnetic or any type of couplings installed. Those cars that do not have connectivity traits however, can be a great decorative car that adds more details and provides imaginative play for kids. It includes many types of vehicles such as fire truck, airplane, helicopter and more. If you want to start low and have a small wooden train set, then have a look at this set from Melissa & Doug. It is one of their most recognized simple train set with tracks that forms a simple figure 8. The set consists of 22 wonderful pieces of wood made train cars and tracks. It could connect with other popular brand of wooden railway trains. It has 2 train cars, one is a coal tender and the other is a train engine car. This is a great starter train kit for kids with ages 2 years and higher. Just for fun and an added entertainment. We want to show you a short video of how this simple train set could bring about loads of fun. Although small and simple, this set can actually expand to a larger set if you feel like so. It uses standard train car couplings and tracks. Buying extra train car collection and expansion pack will make it possible. 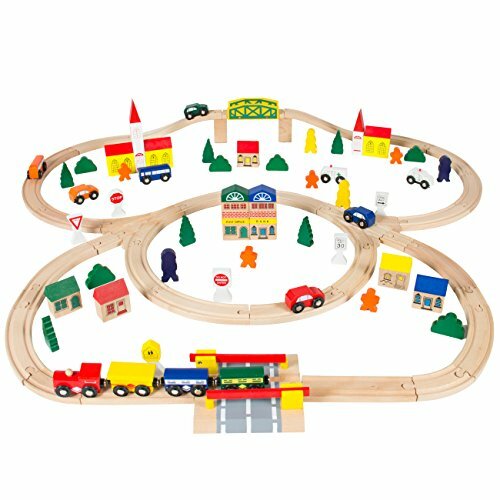 This wooden train cars set and tracks is amazingly simple as for a very low price, it comes with 40 pieces of train parts, cars, tracks and accessories. The tracks and cars are made from strong and solid wood. It includes a manual that features a default lay out but can be changed depending on your preference. It is actually expandable to fit your kids layout desire. You just have to purchase expansion tracks and add some collection of train cars. It is a reminder that expanding does not at all, create a conflict in terms of practicality as most of it are very cheap and affordable. 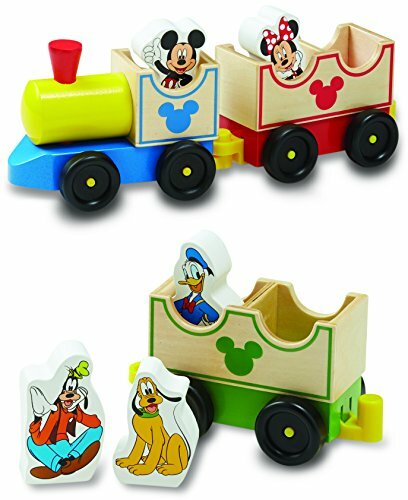 The next set is a vintage wooden train, featuring renowned Disney characters, Mickey Mouse and Friends. This set is a production of two great companies, Disney and Melissa and Doug. It is an all aboard Disney train set for a reasonable price. It is a collectible train car set. The set uses classic wooden couplings which makes it a little bit hard to connect with other late productions of train wooden toys. It it could run however, on wooden tracks like normal train cars. Who isn’t a fan of Disney? At some point in every child’s life, they would love Disney movies, cartoons, characters and songs. The short video below will show you a vintage wooden train integrated with the all-loved, Mickey Mouse and Friends. The love of trains and the love for Disney combined could bring about an entertaining train set for our children. 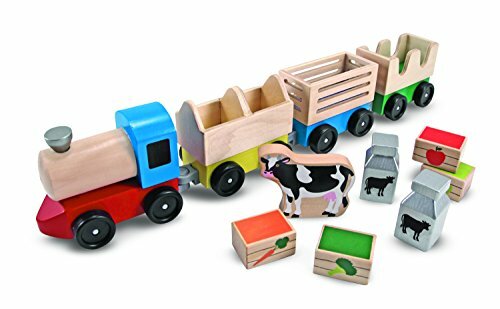 Melissa & Doug feature an animal farm featured wooden toy train. The set consists of 12 pieces, 8 pieces train tracks and 4 pieces divided into train cars and animal figures. It is just a small set with tracks that form a small circle. The set however, is best for beginners. It will be a cheap investment that can later be expanded easily by adding tracks and train cars as it uses standard tracks and magnetic couplings. Each part is made of sturdy wood pieces that for a small amount of price, is guaranteed to last for quite a long period of time. This is a SmartPrix block type wooden train. All parts are made of wood and is designed with a numbered train cars. This cannot run on train tracks and less likely to connect with other brands of train wooden toys. It is specifically made to help children learn to identify colors and numbers as they play. 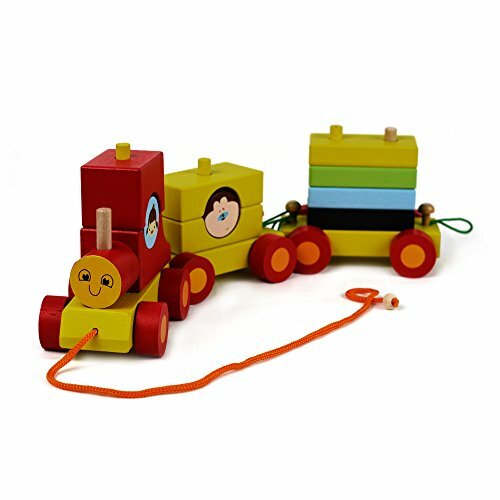 The block train set is strongly made of wood with transparent plastic couplings. It is very cheap but very durable. The toy is recommended for toddlers or for children aging 12 months to 3 years. This wooden train cars comes with 3 different animal figures, a tiger, an elephant and a bear. The set is brought to you by Maxim Enterprise Inc. It is designed with great colors and with animal pictures. The train engine car is driven by a monkey and the passenger car has a picture of a horse and a seal. This is best for beginners and for toddlers. 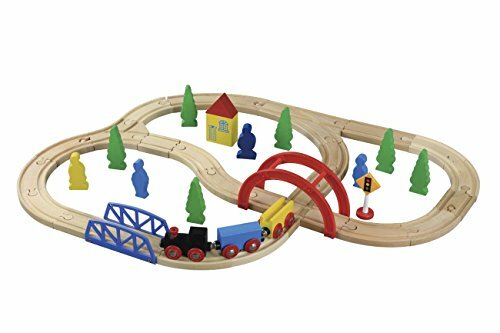 The set, even thou designed for the very young minds, is compatible to attach with other major brands of wooden railway toys and run on standard wood train tracks. Creating a wooden train playground plans is beneficial to your kids. It will not bored them with their set and will give them a lot of options to do imaginative and creative play. You however need to have a starter set to where you can base your plans as you extend. The perfect way for you to do so is through this amazing 50 pieces wooden set from Kid’s Destiny. It has a default layout and comes with so many accessories, tracks and other pieces where you can later on expand to fit your preference. On Track USA features you a medium to large size but affordable wooden train toy set. It has a total of 100 pieces that comes in a transparent container. 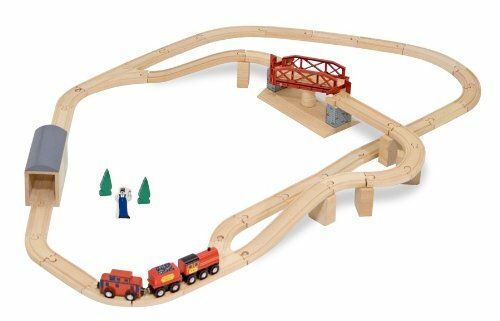 The set already includes wooden tracks consists of straight tracks, curved and switch tracks of different sizes. The set is complete with accessories needed to provide your kids with creative play. It includes a house, building, cars, figures, road signs, bridges and more. Next is a wooden toy train suited for the very young minds. This is best for toddlers or for kids aging 12 months to 2 years old. It is a block type train toy design that is very bright and colorful. It develops children’s mind and enhances their skills. This set discreetly teaches kids about different shape and sizes as well as color identification. The set includes 3 connectable train cars. It does not however, fit most wooden railway train brands. You can have this practical investment at a very low and affordable cost. 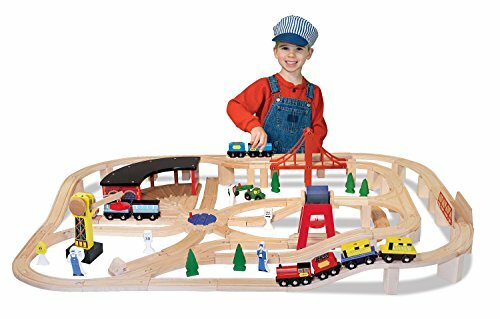 Melissa & Doug wooden train track set features 47 pieces of wonderful and amazing train pieces and accessories with a swivel bridge. It has a simple default train track layout but you can simply change it to meet your standards. You can also have this set expanded, both train cars and tracks. It fits Brio, Chuggington sets and other major brands of wooden toy trains. The set includes a train engine car and 2 train cars, all of which uses magnetic couplings, a standard coupling type most brands use. A kids wooden train you would want for your young ones would this Stacking Train from Lewo. This is a train set with geometric shapes that are being stacked on top. It greatly enhances your children’s capabilities and skills in shape identification, hand-eye coordination and logical skills. Each shapes also possess bright colors wherein it could discreetly teach them regarding color identification. There are 4 train cars. Each have poles where appropriate shapes easily slides through. This educational toy will prepare your kids for a brighter future. It is a very good toy investment. 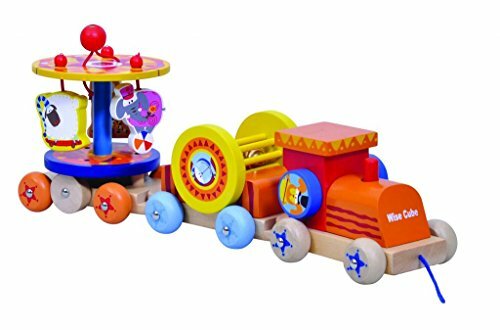 Just to show you how well a kids wooden train set if it is crafted and design to enhance child’s intellect and skills, here is a video of an colorful stacking train from Lewo. Discreetly trying to imply some learning while you simultaneously want your kids to have fun would be perfect for this set. Featuring wooden toy train set packed in a neat and organized plastic storage bin. This set from On Track USA comes in 50 different train pieces and accessories, all that your kids need to have a complete set of train set. 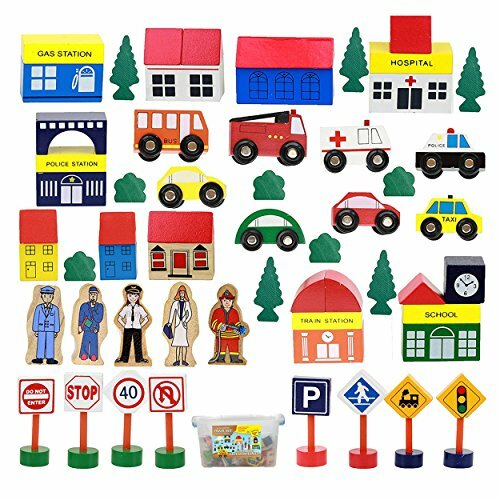 The set consists of 5 wood figures, 4 trees, 8 signs, 8 track vehicles, bushes, buildings and more. The set however, does not include a train tack but it is highly compatible with most major brands of wooden railway track that makes it easier to fit. You can easily buy an expansion set and design your own tracks and have all the details and decorations you wanted with this set. The wooden train toy from Maxime Enterprise Inc. 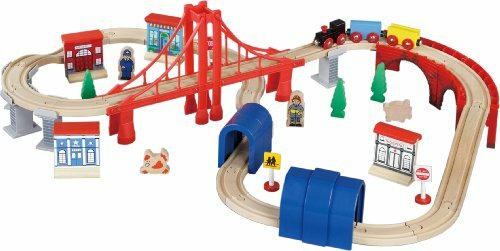 It is a set that features a bridge on the middle and 2 train tunnels. There are a total of 60 pieces included in the set, enough to allow you or your kids to build your ideal train design or layout. There is a well-illustrated manual or guide included in the set which contains an instruction on how to assemble the tracks and other parts of the set. It has a fair size but you can easily choose to expand this set at any point as it is complies with the standard tracks and wooden train car couplings from other major brands. This deluxe set from On Track USA brings to you a large, clear and transparent container, filled with wooden train parts and accessories. 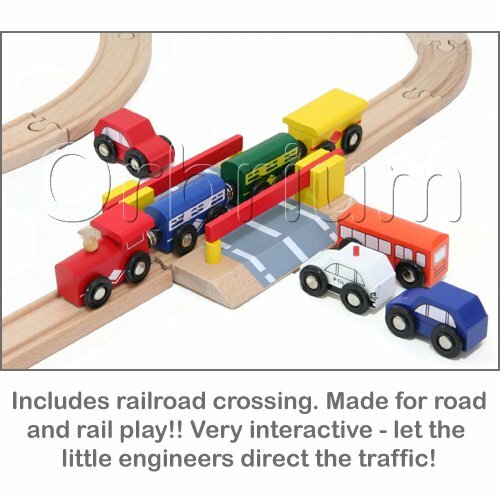 The set includes different types of train tracks consisting straight and curved tracks that comes in many pieces. It also includes all the necessary add-on that creates great details and decorative effect such as buildings, trees, person figure, road signs, animals and more. It is a great starter set for kids due to its expansion capabilities. 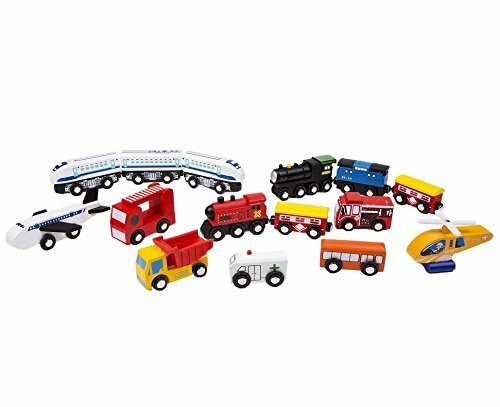 You can easily expand the set as it can fit with other wooden railway train cars and tracks. The next product is a paintable wooden train set from Colorations. This product allows your children to color or decorate their own train wooden toy set and at the same time, play with them right after. The set includes 5 different pieces of wooden train with no design and colors. 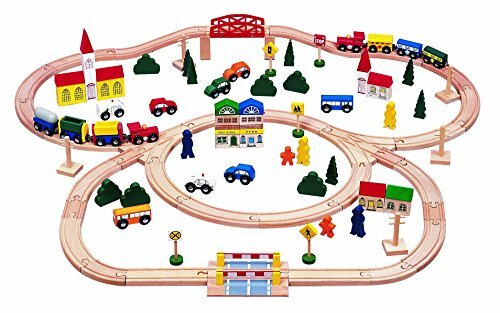 The train toys are made from solid wood construction. Each of its wheels is amazingly handcrafted that it can really roll. The train cars size is about 3 inches in length, 1 inch wide and approximately 3 inches in height. You can easily invest at this artistic toy at a very affordable cost. Showing you how wonderful a wooden train set would be if you add some arts in it, here is a video that shows an easy to assemble train set that allows your child to be more artistic. This way, a child could have his or her own design of the train set he or she wanted. Not only will it help in imaginative and creative play, it will also enhance many set of skills. 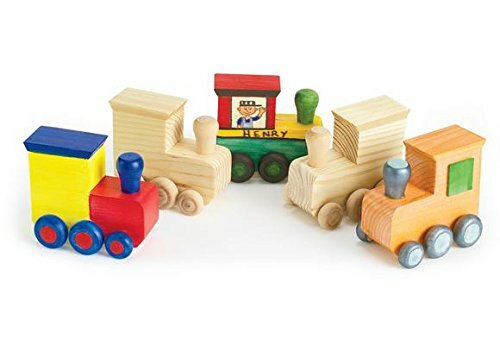 This wooden train cars set is from Best Choice Products. It is practically the same with the triple loop set from Orbrium Toys. The difference that comes in between would be the color of the parts and accessories and of course, the price. There is not that much of a gap between the prices of each sellers and set. Whichever distributor you find yourself comfortable with, you can go ahead. The set features 100 cool train pieces and a track that features a triple-loop design. This set has certified quality as it is passes safety and standard requirements of ASTM and CPSC. The next product is inspired from wooden blocks and shapes. This wooden toy train is from Toy Cubby. It features a train set made from high quality wood with a set (many pieces) of geometric shapes that fits through the poles on each train wooden cars. The set has 3 train cars that if connected, measures to about 12 inches in length. There are different shapes and colors available. It will help in enhancing your child’s skills in color and shape identification as well as logical and reasoning skills. This is a simple kids wooden train set from Orbrium Toys. It features a figure-8 track which means that all the tracks included in the set such as 3 arches bridges and some curved tracks forms a literal figure of the number 8. The set comes with 2 pairs of train car set (4 pieces). Each pair have different designs and colors but with magnetic couplings to allow an interchangeable connectivity. This set is small which makes it a starter set. You can easily expand it later by purchasing additional train tracks and cars. This is a small train wooden set from Top Bright. The set includes 3 train cars with unique design and uses bright and fantastic colors. Each piece is very sturdy as it is made from solid wood. It guarantees a long time of service and entertainment for your kids. The train cars are interchangeable but it is won’t likely be compatible to fit with other major brands of wooden railway sets. It is crafted from the best and exquisite workmanship. It promotes a learning and pretend or imaginative play. 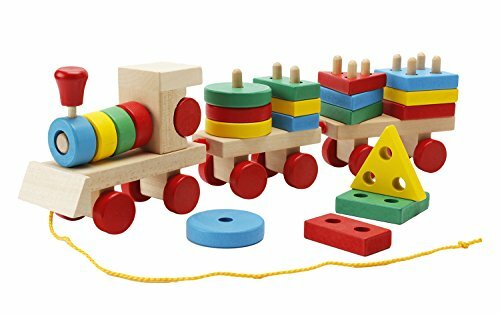 This is an educational wooden train toy that features an easy, pull along train and stacking blocks for kids. There are several colors, blocks used. It is to improve a child’s visualization and color identification. This will also develop their logical and reasoning skills, hand-eye coordination, fine-motor skills and more. For a low amount of investment, the benefits it returns are way beyond what you will pay for. It will prepare your kids for a brighter future while they consistently have some fun. See a great collection of toy train car that features a 5 car CSX from Whittle. It is a short-line railroad train car set with a lengthy train engine car that comes with 4 train cars. Each of the pieces has exceptional details and uses sharp colors of blue, yellow and gray. This is a little bit expensive compared to other type of wooden toy train or set. It is possibly due to the great craftsmanship and the quality of the design. 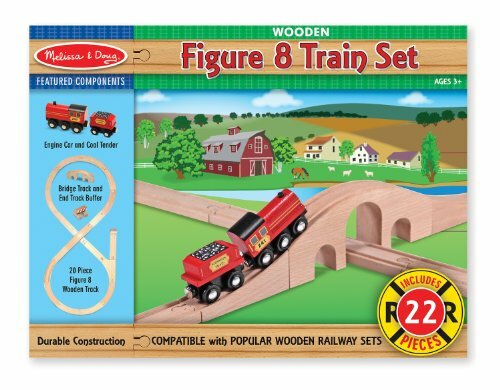 The set holds the same compatibility for most standard wooden tracks and train cars that uses magnetic couplers. This is a small set that features Winnie the Pooh from Melissa and Doug. This is best for any wooden train track as it can easily run through them. The downside would be the compatibility of the set. It uses classic wooden couplings that are a little bit obsolete and could not go along or fit with modern and latest standard couplings which use magnets. The train set has colorful designs which can help teach your children about color identification and inspire to provide a peaceful, imaginative play. 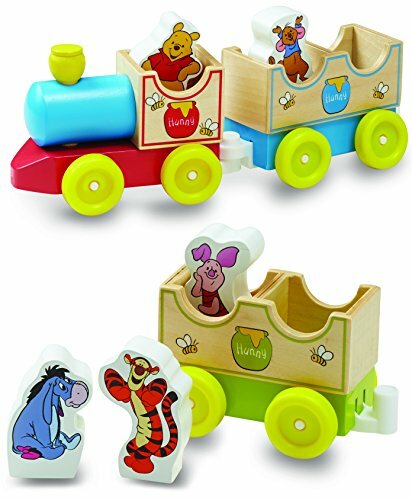 Like with the previous set of wooden train track train set, this is a Disney inspired set that features Winnie the Pooh and Friends. Here’s a short video of how fantastic and magical the set is. Nothing beats a combination of the love of trains and the love of Disney cartoons, all packed into one. The benefits in terms of learning and fun is just countless. 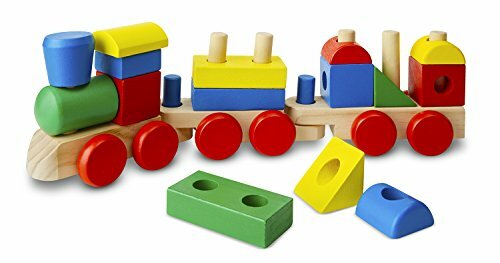 The next set is only one of the many wooden train cars that feature a block inspired, geometric shape stacking set. It is crafted from sturdy wooden construction that uses safe, non-toxic paint for its colors. There are several geometric shapes that your kids can stack and arrange. You would want a train set that can help them educate in identifying basic set of colors. This set is a great skill enhancer and developer. Other than color and shape recognition, it can also enhance motor skills, logical and would help them count numbers.